Vandal Resistant and Tamper Resistant, this is the Bryce Tam 6-Lobe™ type of TORX® Pin screw. The TORX® Pin is an age-old, tamper-resistant screw similar to the Hex-Pin™ but supports a slightly higher torque value making it preferred over the Hex-Pin™ for many applications. If you're an installer or distributor of TORX® fasteners, Bryce Fastener now offers a new and improved TORX® called STYKFIT®6. Contact us for samples. TORX® Pin bits are readily available at most hardware stores. In many cases a Hex-Pin™ bit can be used to remove a TORX® Pin screw. Another problem with TORX® Pin screws is that the center pins can be easily broken out and standard screw drivers inserted. Available at Bryce as the Tam 6-Lobe™ fastener. 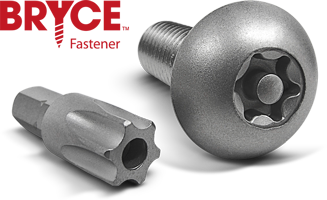 Click for more info about Tam 6-lobe™ Tamper-Resistant Screws.